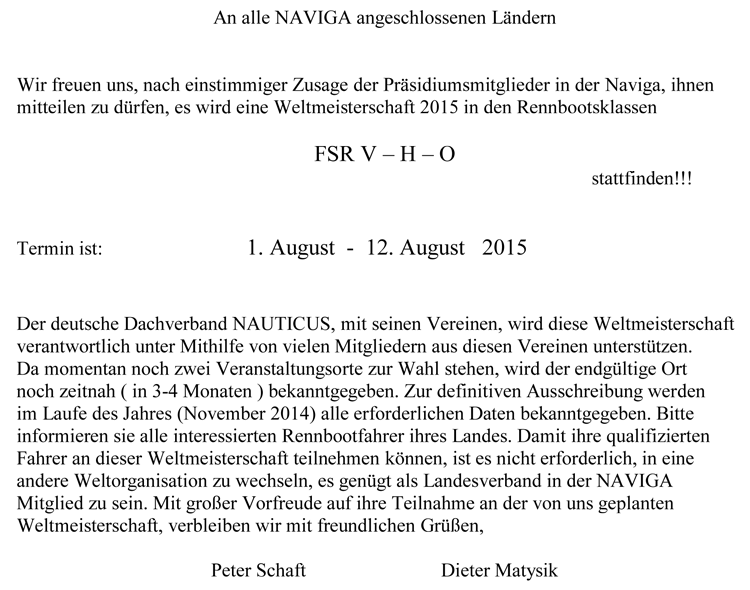 NAVIGA has now made some more official statements that there indeed will be an NAVIGA FSR World Championships being held from August 1 to August 12 2015 in Germany. This is their official statement made in January about the event - LINK. Back in January most of us believed that it was just "talk" from NAVIGA (buying time so to speak) but it seems there was more then that behind their statement. It seems there are several clubs under the German Federation Nauticus that has joined forces and will make it happen in 2015. See below. The Naviga World Championship class FSR (all classes) will be held from 1 till 12 august 2015 in Germany. Further information will be given out later in the year. We are pleased with the unanimous consent of the members of the Bureau of Navigation in , tell them to supply main , it is a World Cup 2015 in the racing boat classes: FSR V - H - O take place !